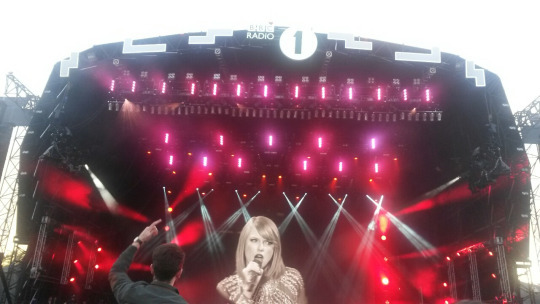 And because I have lucky and generous friends I was able to go to the second day of Radio 1’s Big Weekend. We were generally fortunate with the weather – it did rain for a bit and standing under a tree whilst rain water dropped into your cider wasn’t a high point of the day, but in general it went well. Over the course of the weekend people like Taylor Swift, Snoop Dogg, and Muse, all graced the stage with their presence, making it the most exciting thing to happen in Norwich since Kett’s rebellion (1549). It’s probably also the most media attention that Norwich has ever received. Rain aside, the day was a success and I’m really grateful that I got to go. I hadn’t been to any sort of festival before so it was a nice introduction – although I don’t see myself going to Glastonbury any time soon. 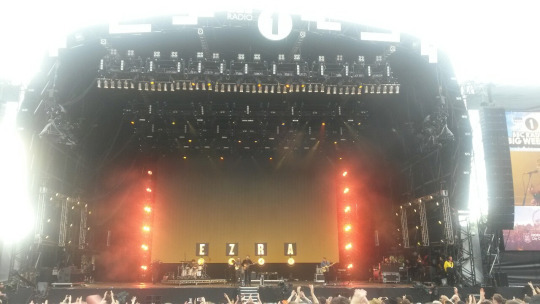 I thought Olly Murs and Imagine Dragons’ sets were very good and seemed to get the crowd dancing, but the general feeling was that Taylor Swift was who everyone was waiting for *possibly controversial statement* (so it was kind of a shame she wasn’t the headline act). Following on from the success of her most recent music video, Swift enchanted the crowd with a short but dazzling (literally if you check out her dress) set, including well-chosen crowd pleasers such as, ‘Shake it Off’. Even though the weekend’s over, UEA need not feel down in the dumps as this coming Saturday is the date for that strangest of UEA traditions, ‘Pimp My Barrow’… more on that next week. I’ve started to make arrangements to go home for the summer but it’s still not really sunk in that I’m a third of the way through my degree now…. I’m sure it will catch up with me soon. Look out next week for pictures of the infamous ‘Pimp My Barrow’ costumes. 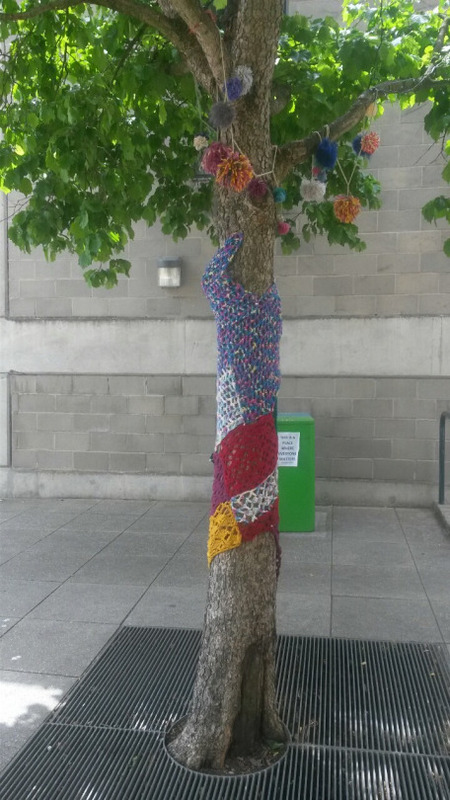 Part of UEA’s yarn bombing…. I can hardly believe I’m typing this but it’s happened… I have finished my first year at uni. It feels like it’s only been a few months and yet I can’t really remember life before UEA either. However, I have a few weeks until I have to clear out from dear Norfolk Terrace so I won’t bore you with the sentimental stuff yet. Instead I’m going to be focusing on some of the more exciting things that are happening on campus. 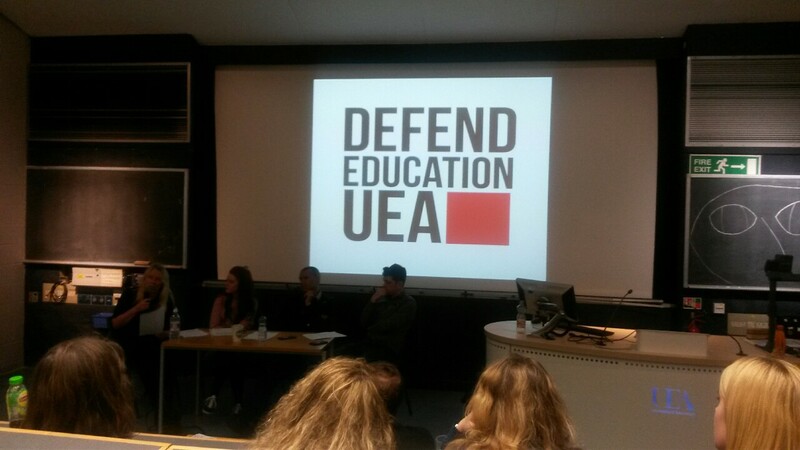 This evening I went to a panel discussion organised by Defend Education UEA, with guests including Jan McLachlan from the Norfolk People’s Assembly, and Clive Lewis, Norwich South’s new MP. The focus of the evening was mainly on Education’s future in the face of a five year Tory majority and austerity cuts, but other topics covered included grass roots activism, the demonstration in London on 20th June, and the difficulties of uniting the political left. What surprised me most however was the relatively low turnout for the event; UEA is often seen as a politically active, left wing university, but now that the election is over some of that fire seems to have gone out. But then again, perhaps it was because the event wasn’t publicised very well. Whatever the reason, it was heartening to see Clive Lewis, so soon after the election, back in UEA. After the debacle with the Lib Dems, I think students now worry that politicians will only show an interest when there is an election looming. Let us hope that this is not the case with our new MP. 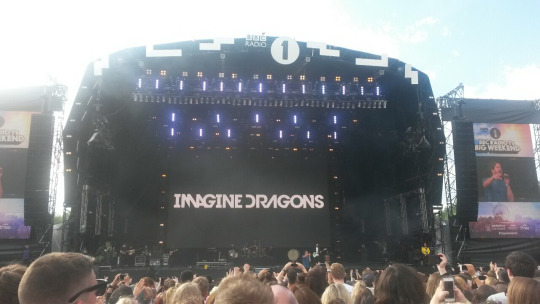 But of course the big event on campus this weekend is the Radio 1 festival, Radio 1’s Big Weekend, which yours truly is lucky enough to have a ticket to this Sunday. More on seeing Taylor Swift in the flesh next week. The event is happening in UEA’s back garden, Earlham Park, so those not fortunate enough to get tickets will probably still be able to enjoy the music if they’re sitting by the lake. I’m very much looking forward to it, and I think it’s going to be a great way to round off the year. But before that there is my favourite event of the year…. Eurovision. I know it’s not very popular in the UK, but I unironically love it.